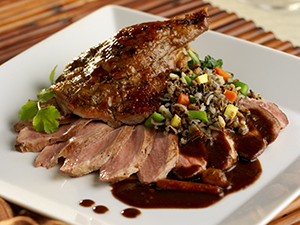 Duck is a protein that has attributes of both red meat and poultry. To maximize its flavor and texture, chef Grasing braises the leg sections in a complex housemade duck stock and sears then roasts the breast. The contrast between the tender, succulent leg and the rosy, crisp-skinned breast makes for a dish that appeals to the eye and the palate. Prepare duck stock; chill overnight. Debone both ducks, separating breast from carcasses; set boneless breasts aside. Remove legs from carcass; trim but leave skin on. In large, deep skillet, brown duck legs. Add 1 cup stock; cover and braise 1 hr. Remove from heat. Prepare finishing sauce: In saucepan, sauté carrot, onion and celery in a little oil until lightly browned. Add five-spice powder and ginger; sauté lightly. Stir in red wine. Cook over med.-high heat until reduced by half. Add 1 cup duck stock; reduce by half again. Season with salt and pepper to taste. Score skin on duck breasts at 1/4-in. intervals, making a criss-cross pattern. Season with salt and pepper. Preheat oven to 350 F. Lightly oil a sauté pan; preheat over med.-low heat. Place duck breast, skin-side down, into pan; cook for 10 to 12 min. until fat is rendered and skin is crisp and brown. Turn duck breast over and sear meat side 2 min. To serve, place 3/4 cup rice mixture on each plate; lay duck leg against rice. Slice and fan out breast meat; top with finishing sauce. Break and crack the bones of the duck carcasses. In 6-qt. stockpot over med.-high heat, heat olive oil. Season duck bones with 1 tsp. salt and ground black pepper. Add bones to pot and brown for about 10 min., stirring often. Add onions, carrots, celery, garlic, bay leaves and remaining tsp. salt. Cook until vegetables are soft, about 5 min., stirring often. Add wine and tomato paste; stir to mix. Cook 5 min., stirring occasionally. Add water. Put thyme and tarragon sprigs in a piece of cheesecloth, tie it together with kitchen twine and add to pot. Add peppercorns; bring mixture to a boil. Skim off any cloudy scum that rises to the surface. Reduce heat to medium; simmer, uncovered, 3 hr. Strain stock through a fine-mesh strainer and cool. Refrigerate overnight and remove any congealed fat from surface. The stock can be stored in the freezer for 1 month.